TQ Diamonds is a full service jeweler - accredited as one of the top jewelers in the country by the American Gem Society (AGS) member since 1999. TQ Diamonds performs all types of jewelry repairs - ring resizing, chain soldering, prong – retipping, rhodium plating, diamond setting, jewelry restorations / refurbishing and many more.Upon inspection of your jewelry, TQ Diamonds will provide you with a Free Estimate for your jewelry repair. TQ Diamonds recommends having your jewelry inspected and cleaned every three to six months. Clean jewelry makes your jewelry beautiful. Plus it increases the life of your jewelry by removing dirt that can cause your ring, necklace, bracelets and earrings to wear out prematurely. Finally a distilled water steam to leave your gemstones as good as the day you first wore them. All jewelry repairs are completed on the premise "in-house" at TQ Diamonds by our highly skilled and goldsmith / platinumsmith team with over 60 years of combined experience. By performing all repairs on site you are assured that your jewelry is carefully inspected and cared for while in our possession. Jewelry is a treasured heirloom and that is how we treat every piece of client jewelry. TQ Diamonds has been trusted and respected since 1987 with 1,000’s of client’s jewelry repairs and restorations. We repair jewelry from clients all over Wisconsin and thru out the United States. Most jewelry repairs are completed in 3-7 days depending on the complexity of the job. Ask about our 1-Day Express Jewelry Repair. Can TQ Diamonds repair my watch? TQ Diamonds is an authorized retailer for every product we sell. Most watch manufacturers have a specific warranty process, that we adhere to, protecting your watch and your rights under your manufacturer’s warranty. If your watch was purchased at TQ Diamonds and has malfunctioned in the first 60 days, we will usually remove a watch from our extensive inventory and provide it to you as a replacement/ exchange – no charge – and we’ll handle the warranty process with the manufacturer. We don't warranty or provide services like band adjustments, time re-setting, battery management, etc for any watches that were not purchased from TQ Diamonds. Can you repair my necklace or gold chain? Typically, yes – it will depend on the link and style. We can usually repair several styles of clasps and jump rings as well. Can you size a ring? Do you offer a warranty on jewelry repairs? Yes! We offer a one (1) year warranty, from the date your item(s) is/ are repaired. We have a 99% success ratio the first time. We have successfully repaired thousands of pieces of fine jewelry for clients since 1987 with complete satisfaction and trust. Do you Rhodium plate jewelry? Yes. Fees vary depending on the jewelry item. Rhodium plating starts at $35 per item. Does TQ Diamonds set diamonds that were purchased elsewhere? Yes. If you have a heirloom or family diamond that you would like set in your engagement ring or wedding band, TQ Diamonds will inspect the stone to insure that it is in a quality diamond and in settable condition, i.e. – no cracks, chips, fractures, laser drilling, or fill material. If your diamond is deemed settable, we ask that you sign a waiver indicating that TQ Diamonds is not liable for damage that may occur to your stone while setting. Fees for Bezel sets and channel sets are additional. How long will it take to have my ring sized? Typically ring sizing is available in two - three days. All work is done in - house and your jewelry never leaves the store. Same day express service is available at an additional cost. If you have a designer engagement ring that requires resizing more than 1.00 size up or down, the designer may require TQ Diamonds to send the ring to them for resizing; if you purchased your ring at TQ Diamonds, there is no charger for this service. If you did not purchase your ring at TQ Diamonds, there will be a fee for resizing. How long will it take to repair my jewelry? Depending on your repair, we deliver 99.9% of our repairs before our “Promise Date” which is usually less than seven (7) business days from the day you drop your item off at TQ Diamonds. Express service (less than 24 hours) and “While You Wait” service (30 minutes to 180 minutes) is available for an additional charge. How much does it cost to have a ring sized? Ring sizing costs vary according to the thickness of the band, kind of metal (10-14-18 karat or platinum), and how many gemstones are in the ring. Ring sizing begins at $32.00. Our laser welder can repair virtually any break on almost any type of metal, including Titanium.Using this new technology, solder and a torch are no longer needed - TQ Diamonds saves you time and money and protects your jewelry from being exposed to excessive amounts of heat and temperature.The Laser simply shoots a focused beam of light, which actually welds metal together producing little to no heat.A filler of gold, platinum, silver or titanium wire is then used to fill the break. Laser technology allows our highly trained laser technicians at TQ Diamonds to fix breaks that wouldn't be possible with torch heat or solder. Who performs my jewelry repair? Your repair will be completed by a trained and certified, TQ Diamonds goldsmith / platinumsmith. TQ Diamonds does NOT send your fine jewelry out of the store to a sub-contractor or 3rd party contractor unless required under a designer or manufacturer’s warranty process*. 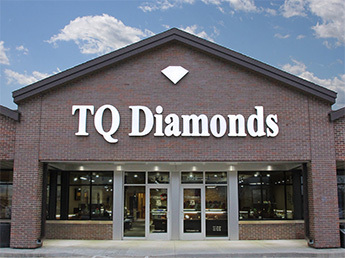 *If TQ Diamonds is required to send your jewelry to a designer or manufacturer to insure that your warranty remains valid, we will discuss this process and time frame with you when you drop your jewelry off for repair. Why does TQ Diamonds use a laser welder for jewelry repair and ring sizing? To save you money and protect your jewelry. A laser welding machine joins two metals together, not using heat, rather a focused light beam that melts a very small area of metal. The benefit of this process, is there is a very little amount of heat generated at the melt point, allowing our certified goldsmith to weld within 0.5mm to 1.00mm of the heat sensitive area without removing any stones. This process saves you money and protects your fine jewelry and stones from exposure to harmful, excessive heat. Will my jewelry repair be noticeable? No. Most of the time, our goldsmith / platinumsmith team are able to blend the repaired area to near perfection. Pricing depends on kind of metal, width of the ring and number of gems. Referred to as Reshanking (The replacement of the bottom of the ring). This is usually suggested if the bottom of your ring has become worn or thin. Adjustable / Adjusto Shanks – Finger Fit – Finger Mate shanks are quoted based on the finger size and the width of the ring. The ultimate solution for an arthritic knuckle. Adjustable shanks are designed for clients who's knuckles are larger than their finger. The ring shank opens up to go over the knuckle. Once the ring is over your knuckle you are able to snap it close. The ring will fit your finger perfectly. The ultimate solution for an arthritic knuckle. Head / Prong replacement is usually needed if the ring is showing excessive wear. The typically 4 or 6 prong head on a wedding set will usually last about 10-15 years depending the activity level of the client. * Clasp is quoted as additional charge if needed. Diamond / Gem Recutting - Quoted per diamond / gem depending on the condition of the stone. TQ Diamonds offers a full service "in-house" jewelry repair shop.Listed above are just a few of the many repairs options we offer. TQ Diamonds has two (2) Certified Gemologist Appraisers, three (3) Graduate Gemologist and a Certified Gemologist on staff. TQ Diamonds is an American Gem Society (AGS) Member since 1999. TQ Diamonds offers many types of jewelry appraisals. The most common appraisal service we offer is a jewelry insurance appraisal. TQ Diamonds also offer Estate, Liquidation and Fair Market Value appraisal services. Jewelry appraisals for items that were not purchased at TQ Diamonds, begin at $85 for the first items and $65 for each additional item. Express jewelry appraisal services are available, beginning at $150. Multiple item and estate jewelry appraisals we will gladly provide a quote. Please contact Kristyn - [email protected] to discuss your specific needs and time frame. If your jewelry was purchased from TQ Diamonds and is over $1,000.00, your appraisal from TQ Diamonds is complimentary - no charge.